“The company has a complete portfolio of SaaS, PaaS, and IaaS cloud services." Fresh from announcing first quarter fiscal year 2016 results, Oracle OpenWorld 2015 came around quickly for the tech giant. And as pointed out by Chairman and CTO Larry Eliison, fiscal 2016 is going to be a “pivotal year” for the company, on the back of a series of Cloud-related announcements in San Francisco this week. “The company has a complete portfolio of SaaS, PaaS, and IaaS Cloud services,” observes Laurent Lachal, research analyst, Ovum. “It does not expect to make any more large datacentre infrastructure investments. It deems itself ready to move out of its Cloud start-up phase into a Cloud expansion phase that will see rapid growth of cloud revenue, as well as margins. But instead, as Lachal explains, during the event the company preferred to highlight its achievements in terms of customer base. So far, the company has added 612 new SaaS customers in the first quarter of fiscal 2016 (brand new logos), while 616 existing customers expanded their SaaS usage. “It currently has 5000 SaaS CRM and 5000 SaaS HCM customers (4000 from Taleo), however its biggest achievement recently has been in the area of SaaS ERP, with 1300 customers, including more than 300 in production,” Lachal adds. “It also has more than 2,500 customers using its Oracle Cloud Platform, which includes services for application development, business analytics, content and collaboration, data management, integration, and mobile. Furthermore, Lachal points out that Oracle has added 800 new PaaS customers in the first quarter of fiscal 2016, while PaaS bookings increased to more than $65 million. “PaaS is clearly the next area of growth, to be followed by IaaS, which was one of the key focuses of the OpenWorld keynotes,” Lachal adds. Delving deeper into Lachal’s analysis, fellow Ovum analyst Adrian Ho believes there is a “strong belief” within Oracle that being best-of-breed in cloud will not quite make the cut in today’s Cloud world. “Oracle believes that its full suite of Cloud solutions gives it a strong competitive edge, with more than 30 percent of its customers buying more than one cloud service from it in the past year. But for Ho, the challenges of cloud integration will continue, especially for organisations with a multi-cloud strategy. 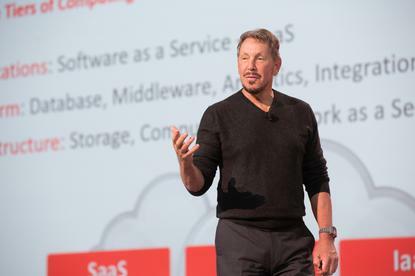 “The allure of having Oracle’s full stack of Cloud services will be very tempting for some enterprises, and this could be one of Oracle’s biggest trump cards in this industry,” he adds.